Mayor Crombie addresses members of the Canada-Croatian Chamber of Commerce. Mississauga has an active, engaged and thoughtful Canadian-Croatian community that continues to invest back in our City as successful entrepreneurs, small business owners and innovative thought leaders, Mayor Bonnie Crombie said. 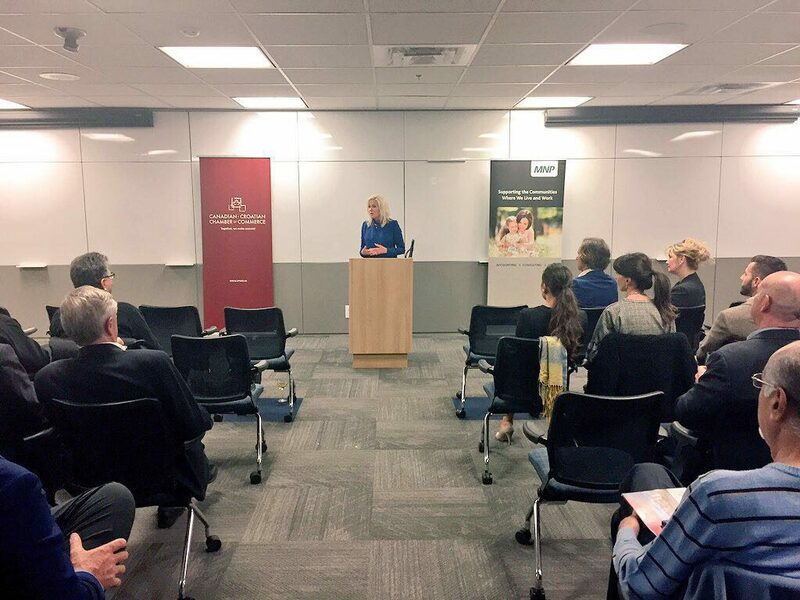 Mayor Crombie made the comments during a keynote address to members of the Canadian-Croatian Chamber of Commerce. Founded in 1995, the Canadian-Croatian Chamber of Commerce continues to be an important voice for businesses across the Greater Toronto and Hamilton Area. Mississauga is home to Canada’s third largest Croatian-Canadian Community made up of nearly 10,000 residents. Mayor Crombie highlighted the staff planning and community engagement taking place as part of the 2018 budget process, reminding members that a city-wide Telephone Town Hall recently took place to hear directly from residents about their budget ideas, priorities and solutions for Mississauga. “As we plan for the 2018 budget – staff are projecting savings of nearly $3 million of taxpayers’ hard-earned money,” Mayor Crombie said. “This would mean a savings of nearly $52 million over the past decade,” Mayor Crombie added. “While the bus rapid transit system (BRT) has become an essential east-west service; the LRT will be the north-south spine of a regionally-integrated rapid-transit network,” Mayor Crombie added.